Using illustrations drawn from psychoanalytic treatment, literary fiction, and everyday life, Micro-trauma : A psychoanalytic understanding of cumulative psychic injury outlines how each micro-traumatic pattern develops and manifests itself, and how it wreaks its damage. The book shows how an awareness of these patterns can give us the therapeutic leverage needed to reshape them for the good. This publication will be an invaluable resource for psychoanalysts, psychologists, psychiatrists, mental health counselors, social workers, marriage and family therapists, and for trainees and graduate students in these fields and related disciplines. Margaret Crastnopol (Peggy), Ph.D. is a faculty member of the Seattle Psychoanalytic Society and Institute, and a Supervisor of Psychotherapy at the William Alanson White Institute of Psychiatry, Psychoanalysis & Psychology. She is also a Training and Supervising Analyst at the Institute of Contemporary Psychoanalysis, Los Angeles. She writes and teaches nationally and internationally about the analyst's and patient's subjectivity; the vicissitudes of love, lust, and attachment drives; and varieties of micro-trauma. She is in private practice for the treatment of individuals and couples in Seattle, WA. Acknowledgments. Cumulative Micro-trauma that’s Hidden in Plain Sight: An Overview. Unkind Cutting Back and Its Navigation. Connoisseurship Gone Awry. Uneasy Intimacy—A Siren’s Call. Psychic Airbrushing and Excessive Niceness. Chronic Entrenchment and Its Collateral Damage. Unbridled Indignation. Little Murders and Other Everyday Micro-Assaults. Toward Repair. Margaret Crastnopol (Peggy), Ph.D., is a faculty member of the Seattle Psychoanalytic Society and Institute, and a supervisor of psychotherapy at the William Alanson White Institute of Psychiatry, Psychoanalysis, and Psychology. She is also a training and supervising analyst at the Institute of Contemporary Psychoanalysis, Los Angeles. She writes and teaches nationally and internationally about the analyst’s and patient’s subjectivity; the vicissitudes of love, lust, and attachment drives; and varieties of micro-trauma. She is in private practice for the treatment of individuals and couples in Seattle, Washington. Crastnopol’s book divides up the world in a whole new way. "Micro-trauma" is a convincing conceptualization of some of the most problematic happenings between people. But despite its novelty—and it is brand-new--what Crastnopol describes will be immediately recognizable to any clinician. Add lucid and entertaining writing that is often actually gripping, and you have the makings of a book that will be read at all levels of the field, from students to seasoned analysts. - Donnel Stern, Ph.D., William Alanson White Institute and New York University Postdoctoral Program in Psychotherapy and Psychoanalysis. 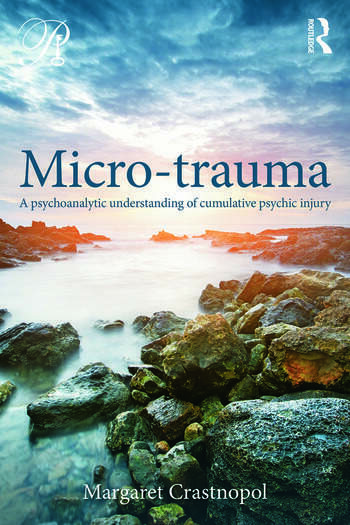 Margaret Crastnopol’s "Micro-trauma: A Psychoanalytic Understanding of Cumulative Psychic Injury" is an exceptional book in that it's a genuinely original contribution to understanding ourselves and others in our day in/day out, lifelong, prosaic, and most intimate interactions. Crastnopol draws on the full range of psychoanalytic thinking to articulate the many ways that we undermine the self-worth and well-being of one another and of ourselves. Reading this book will help therapists and others, all of us, to better understand and catch ourselves as we subtly and unconsciously invalidate, misrecognize, and are misattuned to ourselves and each other. Her creative and literary explications of such relational dynamics as "unkind cutting back," "psychic airbrushing," "chronic entrenchment," and "uneasy intimacy," among many other characterizations, are both immediately useful and unforgettable. - Lewis Aron, Ph.D. Director, New York University Postdoctoral Program in Psychotherapy & Psychoanalysis.